The most important part of installing a pond is planning. Start well here, and the rest will be easy. 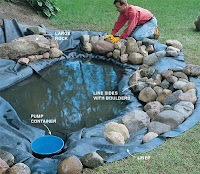 Using a liner to build your pond means that you have a great deal of flexibility in its design. 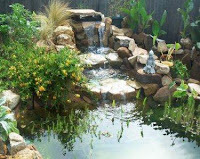 It is therefore worth taking the time to carefully think about what the pond is going to look like when it is finished. It is also important to determine the optimum position for it, both for its aesthetic appeal and also for practical considerations. You should bear the following points in mind, even though you may not be able to implement them all. Proportion - The pond shouldn’t be disproportionate to the size of the garden. Position -The pond should be in a position where it can be easily viewed. Electricity - It is important that an electricity supply can be run down to it. Aspect -The pond should be in the sun for about 6 hours a day in order to promote good plant growth, without encouraging excessive algae problems. Trees -Over-hanging trees can present a problem as they drop blossom and leaves, which poll ute the water. Strong root growth can also threaten the structure of the pond,and therefore it should not be situated next to large trees. Certain trees, such as willows, are also poisonous and should be kept well clear of the pond. It is also advisable to keep the pond away from cherry and plum trees, as they provide over-wintering sites for the eggs of water lily aphids. Style -The style of the pond must suit its surroundings. For example, a wildlife pond will look out of place in a formal patio. Access- The pond should be accessible for occasional maintenance.